The Mattawang Golf Course of today is very true to its original layout. As was typical of course design for private clubs in the 1950’s and early 60’s, the idea was to create a challenging venue, in a natural setting, with a premium placed on shot-making skills. Unlike so many recently built courses, the Mattawang Golf Club offers few of the design “gimmicks” that often make one new course indistinguishable from the next. There are no man-made water hazards or contrived, exaggerated contours, no artificial mounding or theatrical bunkers. Instead, a few streams, a couple of ponds, large old evergreens, shade trees and tall grasses combine to create the character of the holes. Golfers of every level who experience the Mattawang’s classic, traditional layout find it to be a challenging test of their skills and an experience they can enjoy over and over again. An important part of any golf experience is the interaction with the staff and how they serve you, the customer. The Manager and Head Golf Professional at The Mattawang Golf Club is Mahlon Dow. A local to the area, for over twenty years he has been a highly regarded member of the New Jersey golfing community and a well respected instructor. In fact, Mahlon’s teaching record includes the training of seven Junior New Jersey State champions. He has a trained professional golf staff to assist every golfer’s needs. Individual and group lessons are available. A ladies program and league have been in place since 1997. A junior golf program which has grown to become the largest in central New Jersey, (and is near and dear to Mahlon’s heart) is run throughout the summer months. This includes instructional clinics, a league, and combination adult/child tournaments. 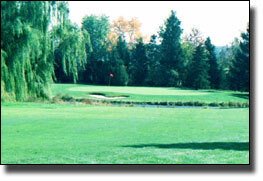 The Mattawang Golf Club was originally opened in 1960 as a private golf course under the Pike Brook Country Club. It continued to operate in this manner until the early 1980’s, enjoying a stable membership and a reputation as a “hidden gem” of a golf course. Early in its existence during an invitational tournament, Jack Nicklaus shot a score of 66 from the back tees, which remains the course record. In the mid-1980’s the course was sold to a series of developers and barely survived plans to be turned into housing. In 1993 the present owners purchased the course. They immediately embarked upon a rigorous program of maintenance and improvement. A new clubhouse was constructed, a new sprinkler system was installed, greens and tees were enhanced and/or rebuilt to restore and improve their ability to handle increased public play. Bunker complexes were redesigned and reconstructed, and above all an extremely capable golf course superintendent and maintenance team were brought in to keep everything in peak condition. With the change to a semi-private, daily fee course a new name seemed appropriate. Through research at the local library, it was discovered that at one time a local Native American tribe had lived on the site of the property. Their name was the Mattawangs which translates to “travel a difficult path”. The Mattawang Golf club is now operated as a semi-private golf club. Public daily fee players are also welcomed, and are able to enjoy advanced tee time privileges. Annual individual and family memberships are also available.